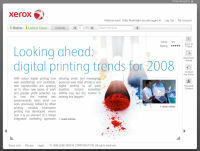 The is an online magazine built for Xerox targeted at the print industry. It has a Drupal content management system behind the scenes for publishing new issues. This site is built using Cairngorm. I was part of a team of 3 Flex Developers who were working on this project when I was at Tequila. The application allowed users to upload images that represented their nation and vote on other people's submissions. 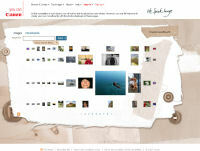 It also allows you to design collages made up from the images submitted to the site. This site is built using Cairngorm. 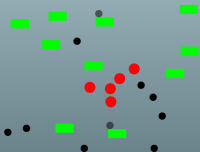 This is a property game built using Flex. This project had already been started by another developer when I arrived but I had to provide the finishing touches and bug fix it. The game is a quiz with a number of levels. After answering each question you have to place a building on the street to build your property portfolio up. I built this site to learn more about Cairngorm and was the first site that I built from scratch using the framework. 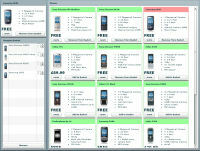 The site loads a list of phones from an xml list and allows users to view details about each phone and add them to a basket by drag and drop or using the buttons. I had more plans for this site such as sliders to filter the list on price / weight / battery ect but never got round to implementing them. You can download source code for this project here. This project was really just a time filler when I didn't have much else to do. I wanted to experiment with simulating bouncing balls in flex. I think what I have implemented works quite well but it is certainly not finished. There is currently no deflection of the ball when it hits another circle (it's harder calculating the new trajectory than with rectangles). Each object also only deals with collision detection with 1 other object at a time so if you have 2 touching balls resting on a rectangle they tend to fall through it. Again it's harder to work out a resulting trajectory if a ball is in contact with 2 other objects at once.